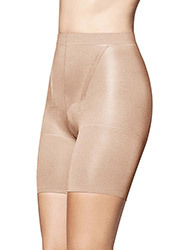 Maidenform are the masters of discreet, comfortable control underwear, and their High Waist Thigh Slimmer is the best item on the market for shaping and smoothing your lower body. The cut is ideal for comfortable wearing, as the material is lightweight but ultra smooth, without compromising on that great support and control that Maidenform’s products are engineered for. The design is subtle and can be worn under any below-the-knee outfit.